April 30, 2018 – Dayco Australia embarks on the company’s most exciting motorsport program to date in 2018. Featuring Supercars, Tarmac Rallying, Porsche Carrera Cup and GT Racing, the renowned Dayco logo will be seen by millions of motorsport fans at the many high profile events that each category includes, along with their television and live streaming audiences in Australia, New Zealand and across the world. The most high profile addition to the Dayco motorsport program in 2018 is the leading aftermarket engine component suppliers’ Supercars involvement. Making the change from a five year stint with Nissan Motorsport, the Dayco logo can now be seen on the rear wing of one of the four Tickford Racing Ford Falcon Supercars, the Monster Energy Falcon driven by 2017 Sandown 500 Champion driver Cam Waters. This new Dayco partnership was christened with a top five finish in the second leg of the season opening Adelaide 500. Dayco also enters its sixth season as the major personal sponsor of Supercar enduro and International GT racing driver David Russell. “Dayco Dave” will be competing in this year’s Sandown 500, Bathurst 1000 and Gold Coast 600, making a big move to Tickford Racing this season after competing as a Nissan factory team driver for the past five seasons. Russell will be co-driving with 2017 Sandown 500 winner Cam Waters in the Monster Energy Tickford Falcon. Along with Russell’s Supercars involvement, the talented racer also plans to compete in selected major local and international GT events during the season. The Dayco ambassador kicked off his Intercontinental GT Championship season with a top ten finish in the 2018 Liqui-Moly Bathurst 12 Hour in February co-driving the JBS Australia Lamborghini R-EX with Roger Lago and Steve Owen. Dayco Australia has also continued the company’s successful involvement in the Rally category, once again continuing its sponsorship of successful racer Alan Roe and co-driver Michael Lloyd. There has also been a change of car for the new season, Roe having parted ways with his highly successful Mitsubishi Evo 6 to debut a brand new BMW M2. The success of this move was confirmed early in this year’s CAMS Tarmac Rally Championship with a third place in February’s Targa North West held in Victoria. This exciting new car will be competing in the entire Championship which includes the world renowned Targa Tasmania event. The 2018 Dayco Australia motorsport program also includes the 2018 Porsche Carrera Cup, with leading Pro-Am category driver Roger Lago competing in a brand new Porsche 911 Cup Car and debuting with three victories from three races at Adelaide’s opening round. continues its involvement with Melbourne’s Monash University Formula SAE Team, known as Monash Motorsport. This team competes in national and global Formula SAE challenges throughout the year, seeking to win against the best local and international University teams. Dayco also supplies components and related technical support to this team. According to Dayco Vice President Asia Pacific Aftermarket, Arnold Mouw, the company continues to maximise its exposure to the trade through front line motorsport. 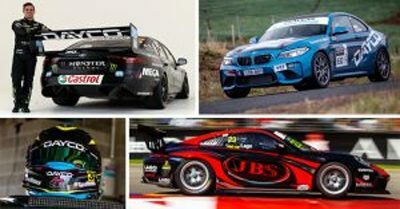 “We have a program of exciting motor racing categories that ensures strong Dayco branding reach to our trade markets across Australia and New Zealand, sometimes even extending beyond those regions as well” Mr. Mouw stated. “It is great to have Dayco join one of the top three teams in Supercars this season and to be a part of the inaugural CAMS Tarmac Rally Championship with a brand new car there as well. We also continue our highly successful Supercars and GT partnership with David Russell this year and look forward to his debut with Tickford Racing at the major Sandown, Bathurst Gold Coast endurance races,” he added.